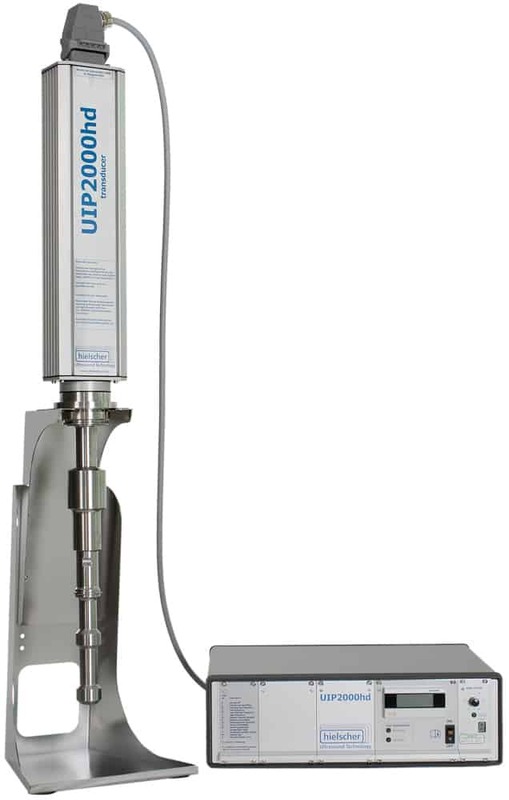 The ultrasonic processor UIP2000hd (20kHz, 2000W) is a powerful and adaptable ultrasonic device for the industrial processing of liquids. 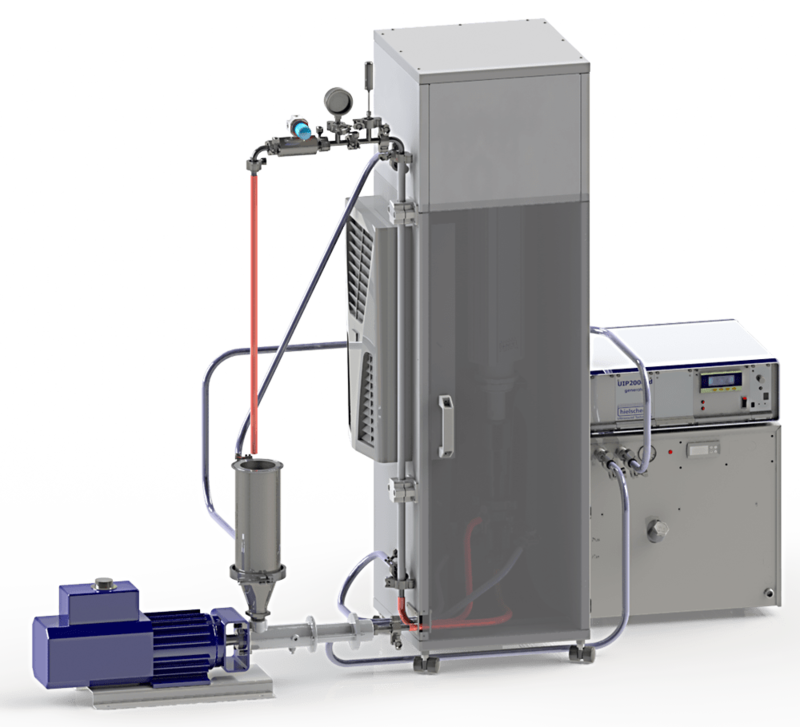 It is used for applications, such as emulsification, dispersing & particle fine milling, lysis & extraction or homogenizing. 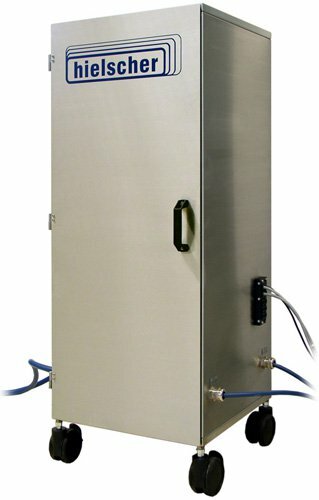 Despite the enormous power of the ultrasonic processor UIP2000hd (2000 watts, 20kHz), this ultrasonic device does not need any additional cooling by water or compressed air. The device can be operated continuously in air, too. 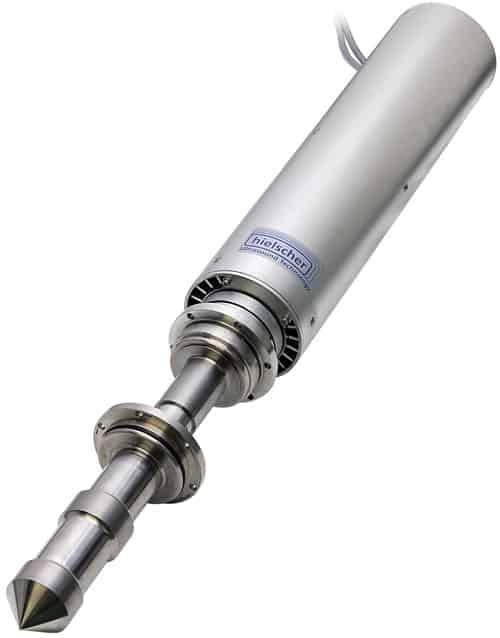 The robust design of the transducer, made of stainless steel and titanium, enables use under extreme conditions of dust, dirt, higher temperatures and humidity. 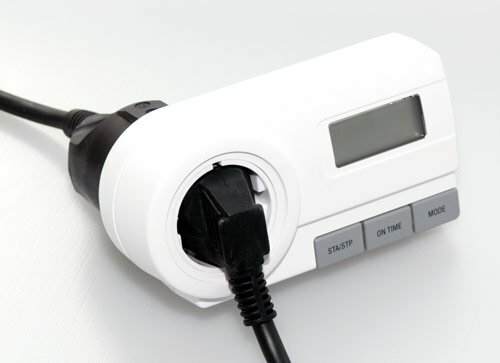 According to the operating needs the generator is located in a housing or in a cabinet and is equipped with control displays as well as with electrical interfaces. 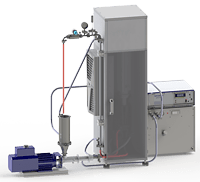 Important applications for the ultrasonic processor UIP2000hd are the intensive cleaning of continuous material such as wires, tapes and profiles, of single components or bigger bores. Sonotrodes are chosen to match to the application. The treatment of sewage sludge for a better gas yield, the production of very fine emulsions and suspensions, the extracting and homogenizing as well as the reducing of germs are applications with this device in large scale. Corresponding sonotrodes e.g. the cascatrode™ provide the required intensity of ultrasonic treatment of the liquid. 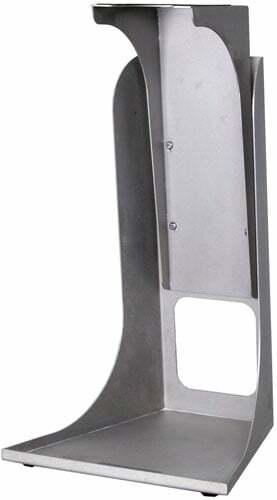 Corresponding flow cells are offered for continuous operation. Sound protection casings complete the ultrasonic system based on UIP2000hd. The picture above, shows a disintegration system of 24xUIP2000 . The combined power of 48kW is used for the processing of approx. 6m³/hr. An extensive list of manifold accessories, such as sonotrodes, boosters and flow cells is available for the UIP2000hd. 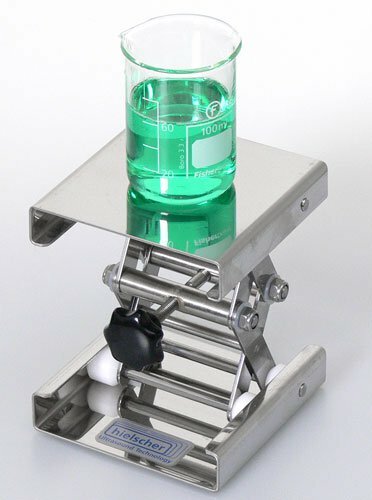 In combination with a sonotrode and the stand, you can sonicate sample beakers to test various liquid formulations for their response to sonication. The UIP2000hd is designed and built for commercial production. This ultrasonic processor requires little maintenance, is easy to setup and simple to clean and to sanitize. The UIP2000hd has a very high efficiency in the conversion of electrical energy into mechanical oscillations of the sonotrode. This means, that more energy is transmitted into the liquid, resulting in a better sonication. The overall energy efficiency of the UIP2000hd is approx. 80-90% from the power plug into the liquid (click at the image above to enlarge the chart). The amplitude of the UIP2000hd is electronically controlled, so that the magnitude of the mechanical ultrasonic vibrations at the sonotrode is constant under all load conditions. You can change the amplitude from 50 to 100% at the generator and additional ranges by using various booster horns. The chosen amplitude is being held constant, while sonicating any material at any pressure. This feature gives you full control over the most important sonication parameter: Amplitude. The UIP2000hd is equipped with an intelligent automatic frequency tuning. The generator finds the optimal operational frequency of attached transducer-booster-sonotrode configuration, automatically. This results in a higher overall energy efficiency and reliability. If you would like to evaluate the UIP2000hd for your purposes, you can rent all standard items at good conditions. 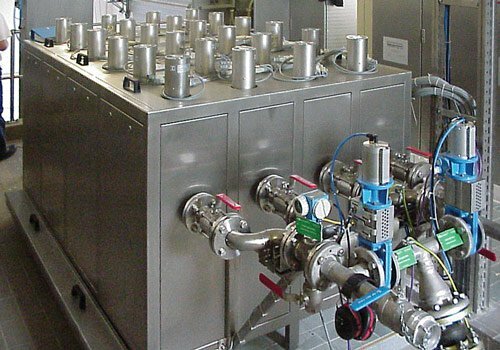 Alternatively, you can conduct process trials in our process laboratory. A list of standard accessories can be found below. All items are typically carried in stock, so delivery time is really short. Please use the form below, to ask for a proposal or for a UIP2000hd with suitable accessories. We make customized accessories, too. This includes special sonotrodes or flow cells. Feel free to describe your particular requirements in the comments field in the form below. Request a Proposal for this Item! To receive a proposal, please put your contact details into the form below. A typical device configuration is pre-selected. Feel free to revise the selection before clicking the button to request the proposal.